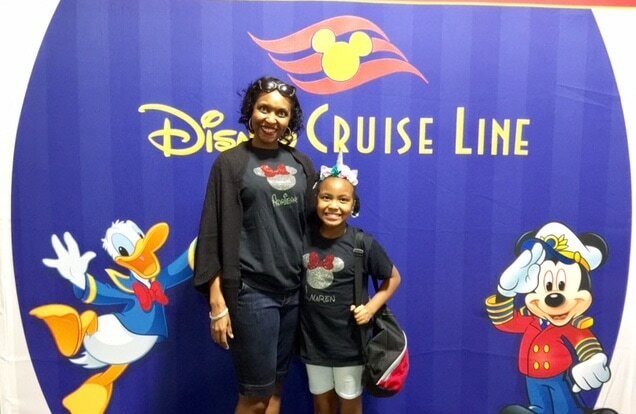 Earlier this year we decided to give our children a Disney cruise for Christmas! I spent the year scouring posts, forums and blogs for any tidbit of information that I could glean to prepare for not only the big reveal but our pending cruise. My kids have been asking to go on a Disney cruise for so long. Every time I’ve looked into cruising with Disney the price astounded me enough to redirect and book with a different cruise line. However, Disney was offering a repositioning cruise in early January that definitely caught my attention. Not only were the ports of call places of interest for me but the price was much more reasonable than any I’d ever seen with Disney. So, without further thought, I called our travel agent, booked the cruise and prepared for the countdown to our Disney adventure. 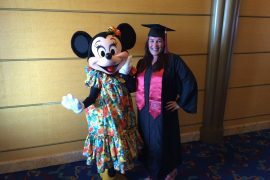 As first time Disney cruisers, there was so much to learn and prepare for prior to our sail date. 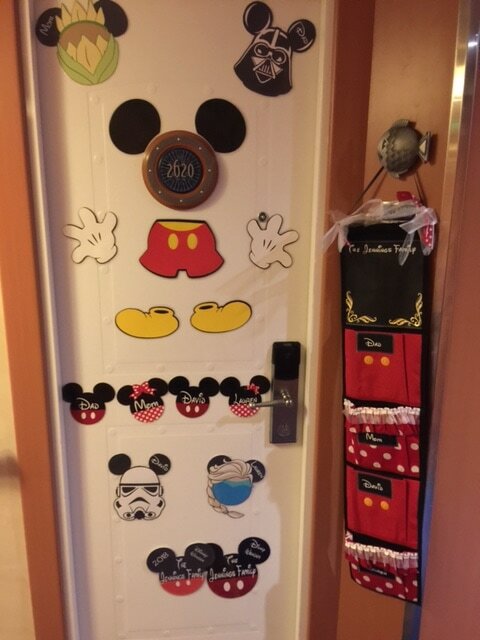 While reading everything I could find out about Disney, I soon consumed myself with the task of ordering fish extenders, matching Disney cruise t-shirts and door magnets. 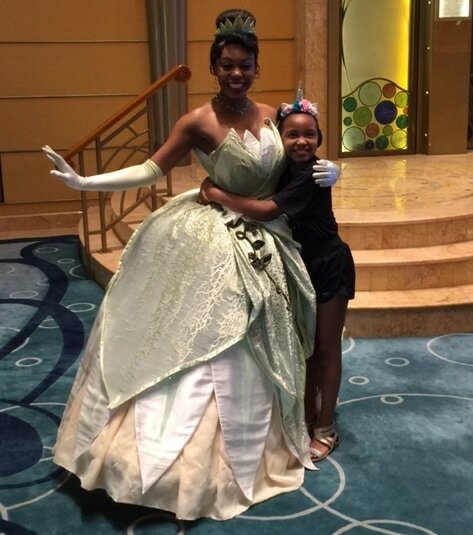 Since the cruise was a surprise for the children, it was quite a challenge to keep all of this from them but I was definitely up to the challenge. Several days before Christmas, we learned that our son was chosen to participate in his school spelling bee. I was such a proud mom and congratulated him gleefully, right up until he told me the date. His spelling bee was scheduled for January 11th. That was two days AFTER we were scheduled to set sail. As we were so close to Christmas Day, my husband and I decided that we’d let our son decide if he was going to stay for the spelling bee or take the cruise. In the meantime, we decided to buy him a few extra Christmas gifts for just in case he chose to forego the cruise. On Christmas morning, much to everyone else’s surprise, my 5th grader opened all of his Disney gifts and with a confused expression on his face asked, “Wait…are we going on a Disney cruise? !” After learning of the date, he looked at me with sad eyes before apologetically explaining that ‘he couldn’t miss the spelling bee’. I assured him all was well and that I respected his decision and was incredibly proud of him. My husband decided to stay behind with him and so my daughter and I set out for our first ever girls’ trip! We could not wait! Since it was only the two of us going on the cruise we decided to fly to port instead of driving as we’d originally planned. I found inexpensive plane tickets on Southwest from Dallas to Houston Hobby the night before departure. We took the Galveston Express from the Hobby airport to the hotel. We had a good night’s sleep, ate breakfast and caught an uber to the port the next day. 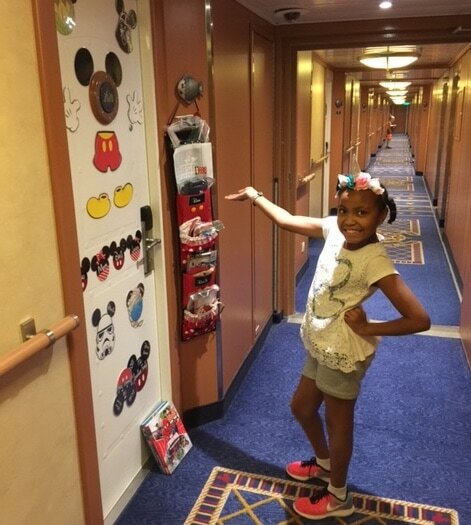 Prior to departure, Disney mails you a cruise booklet with luggage tags and documents to make your pending sail date as easy and efficient as possible. Upon arrival to the port, a gentleman greeted us upon exiting the vehicle and took our luggage. He asked for our luggage tags (which I quickly retrieved from my purse), took our things and directed us into the terminal. Everyone signs up for a port arrival time when doing their online check-in. 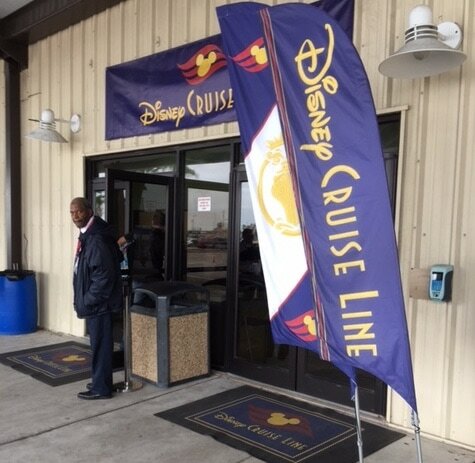 Your check-in date is contingent upon your sail history or level with Disney cruise line. As we were first time Disney cruisers, we were the last to check in. I learned all about this process from the Disney cruise’s Facebook page but I will go into detail about that later. Our port arrival time was 11:30am to 12:00pm. We were shown into the terminal and my mouth dropped. 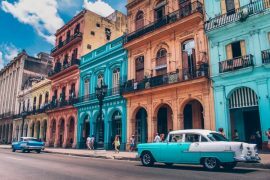 If any of you read about my previous cruise then you’ll remember the long lines that stretched and snaked throughout the terminal and the long wait for embarkation. Well, Disney would prove to be quite different. We walked into a completely empty terminal. The line was clear and we were able to walk right up to the security checkpoint and put our bags on the scanner. We gathered our things and followed the directions of the Disney cast members. We were shown to a short, rapidly moving line for first time Disney cruisers. Within minutes we were called up to the front for check-in. As this was a terminal or open loop cruise (did not return to the original departure port), we were required to travel with our passports. I handed the cast member our passports and went to retrieve our port arrival form my travel notebook when he merrily announced ‘all done’. He quickly presented my daughter with a kids’ club bracelet and advised her that she had to wear it the entire time she was onboard. He also gave us a card which indicated we were in boarding group 6. We went into the boarding area, took a picture in front of the Disney cruise line backdrop and went up the escalator to wait for the first embarkation group to board. While in the lounge, there was the first of many character photo opportunities. My daughter tugged on my hand and said, “No mommy! I don’t want to take a picture. Please don’t get in line”. I want to take a moment to explain my daughter’s pleading outburst. I love photos. I always purchase a photo package and have gone on record to say that pictures are my souvenir. I wholeheartedly believe they capture a moment in time that will forever be immortalized. You’ll never forget the memories or the joy that you felt in that moment once it is forever captured on film. 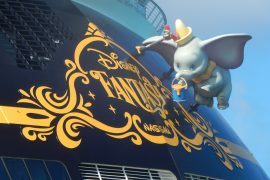 Disney allows you to pre-purchase the cruise photos. It is slightly discounted from what you could purchase onboard and if you do not like any of the pictures, you have until the final day to advise Shutters (the photo lab) that you no longer want the photo package and they will credit your account. As such, it’s a win-win situation. As Disney has limitless photo opportunities, I would highly recommend that everyone pre-purchase a photo package and simply cancel it if you do not want your pictures. Since this was the first of many agonized pleas to not wait in line for pictures, I ultimately cancelled my photo package on the final night of our sailing. After a short wait, Disney began boarding passengers in order based upon the number on your card. Photographers were in place to take photos upon embarkation and my mini me actually obliged me and smiled for the camera. We wound our way around to the ramp that would guide us onto the ship and were met with a hand sanitation station. We retrieved some hand sanitizer and moved forward in the line. At the entrance of the ship you are warmly welcomed by a Disney cast member and asked for your names. Upon giving them your name, the cast members announce you onto the ship with a cheerful, welcome greeting. I smiled so big while they all clapped for us as we entered the ship and took in the sheer beauty of our surroundings. The foyer was so elegant. The glass elevators were off to the right and there was a sweeping staircase on the far side of the room. Triton’s restaurant was off to the left and a smiling cast member promptly advised us that ‘lunch was being served in the dining room or we could proceed to Cabana’s, the buffet’. I want to provide a bit of background information. I despise everything about the buffet. I try desperately to avoid it and would gladly eat all of my meals in the dining room if possible. I don’t like buffets on dry land and cringe when my family suggests going to anything that mildly resembles one. The germs alone send me into a tailspin. 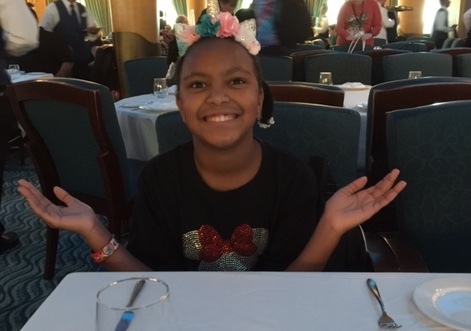 So, when this smiling crew member told me that lunch was served immediately upon boarding the cruise, I decided in that moment that this would not be my last Disney cruise. We went inside and were seated in a lovely dining room. There was featured wall that had a collage of King Triton, Ariel, Sebastian and Flounder along with all of their friends. 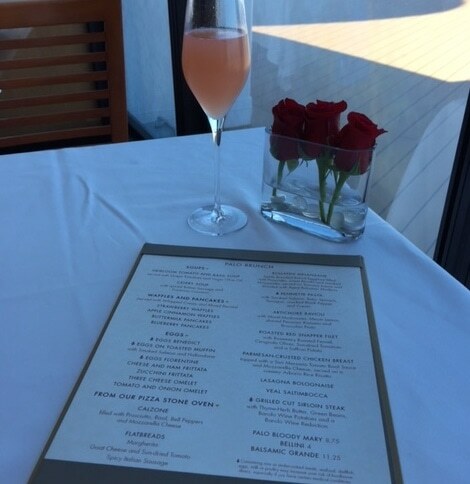 The menu looked delicious and I could not wait to try some of the delicious food that everyone raved about online. I ordered seafood and chicken gumbo with cornbread for my appetizer, chicken Caesar salad for my entrée and cookies ‘n cream cheesecake for dessert. It was absolutely delicious. My daughter ordered pennette pasta and the cheesecake as well. During lunch, my daughter began to inquire about when we could go to our room. Since the rooms were ready at 1:30pm, I knew that following our leisurely delicious meal that we would be able to get into our rooms. However, I was more eager to explore the ship prior to our 2:30pm meet n greet. We walked around exploring before finally retiring to our room to drop off our things. After taking a few moments to refresh ourselves, we headed over to the meet n greet in the Promenade Lounge. 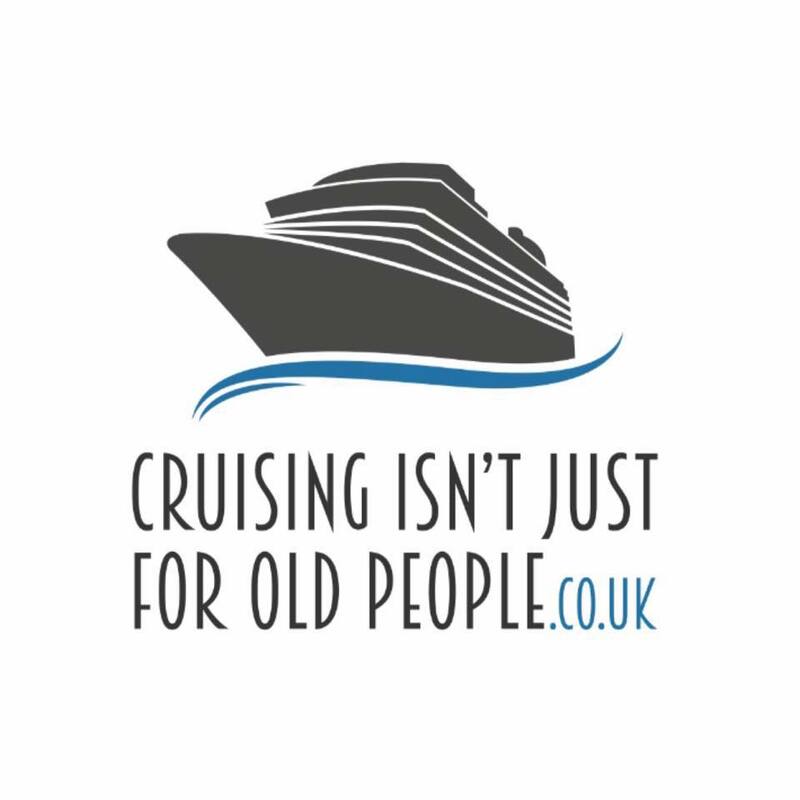 This leads us to a good place to discuss the Facebook (FB) cruise page. Last summer was the first time I ever participated in any kind of group chats or forum posts for upcoming travels. I remembered overhearing people discuss this on a cruise we took several years ago but I was not on any social media sights in those days. 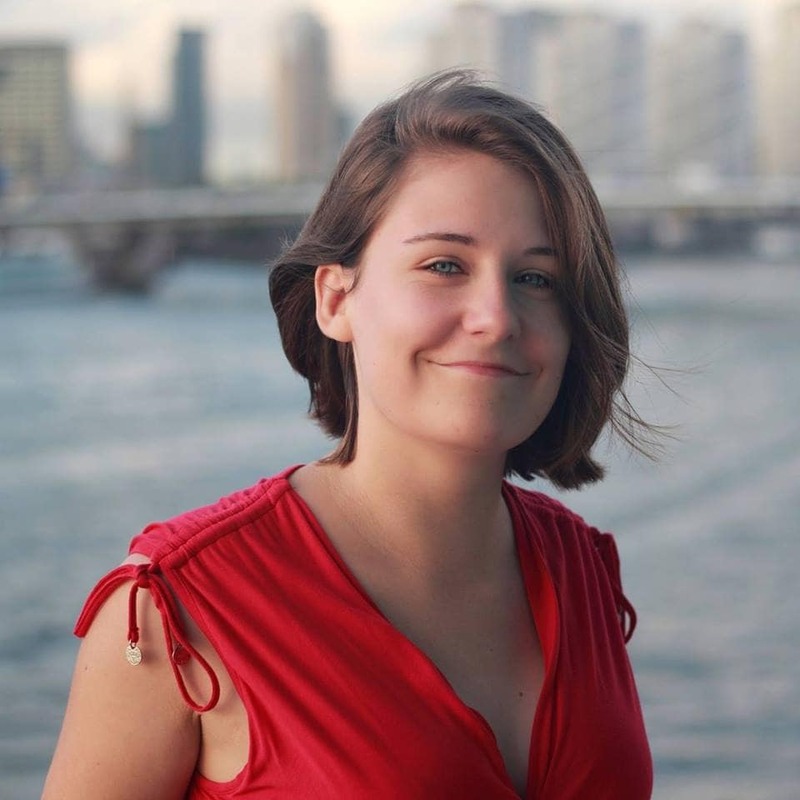 On a prior cruise, I spent a great deal of time conversing with fellow passengers on cruise critic and enjoyed putting a name with a face while onboard. It was a fun way to pass the time, gain new information about your pending cruise or destination and get to know fellow passengers. This time would prove no different. The only major difference was cruise critic interaction for this sailing was non-existent. I started the group on this particular sailing and very few people participated. While on Facebook, I noticed a Disney page and decided to search my sailing and found an entire page dedicated to this trip. We all began conversing and sharing information about Disney cruise lines, Falmouth, Jamaica and the city of our disembarkation, San Juan. This was also the page where groups were organized for fish extender and pixie dust exchanges, pen pals, mixology, open bar and a number of other things. You could be super involved or just read the comments and never engage. Since I had such an enjoyable time at the last two meet n greets I’d participated in, I decided to call Disney one day while I had some downtime and inquire about the process of requesting a space for us to meet. I shared the information on the site and was excited about the response I received from people interested in attending. We had a large turn out for our meet n greet! It was so neat to meet all of the people I’d been chatting with online! People would recognize me and stop us to say hi, even in the terminal. I was excited for the adventure ahead and all of the people that I would get to interact with over the course of the week while my child was in kids’ club. I had no idea, at that time, how my child would be by my side, in lieu of the kids’ club, for much of our trip. After the meet n greet, we retired to our stateroom to unpack our bags before the safety drill. We headed up to the deck for the safety drill before being dismissed and going up to the sail away party. We were told, on our FB page, that Disney sail away parties are not to be missed. We were not disappointed. The entertainers came out to sing and dance while welcoming us aboard! Pompons were handed out and everyone was involved in the excitement! Near the end, Mickey, Minnie and the gang all made an appearance to say ‘Welcome Aboard’! We met another familiar face from the FB group, chatted amicably and moved on to the kids’ club to check out the open house. Fish extenders are a fun part of Disney cruises! They are not sponsored by Disney but they are so much fun. There is a metal fish outside your stateroom door where people hang their decorative fish extender holders to receive the gifts that people leave. My daughter had so much fun returning to the room to see what was left in our holder. We had a ton of fun and will definitely plan to do fish extenders on future Disney sailings. We went to the kids’ club for an open house and it was amazing! There were so many nooks and crannies and themed areas for the kids to play. I wanted to spend time there and enjoy the area as well. While my daughter played in the room, I sat at the table and colored while talking to two brothers who reported they were on the cruise with their parents and had been sailing Disney since they were small children. Oceaneer’s, the kids’ club, had two entrances on the 5th floor. Both entrances required the children to put their bracelet against a metal post for sign in or check out. The parent was required to provide the password that was established during the online check in process. Though the entrances were in two different areas, there was an enclosed hall that connected both areas and allowed the children to roam freely and securely. If at any time a parent came to the kids’ club to retrieve their child, their wrist band would allow the cast member to advise you of their exact location within the club. Though Disney’s kids’ club appeared to be a fun-filled extravaganza, my child was not interested in spending very much time there at all. I was consistently called on the wave phone or contacted via text message in the onboard app with requests from her to come pick her up. When I asked why she didn’t want to stay she simply stated that she wanted to be with me in the room. Upon further prodding I learned that she missed her brother and the kids’ room wasn’t the same without him there. Maybe on the next Disney cruise, she will have a better experience. 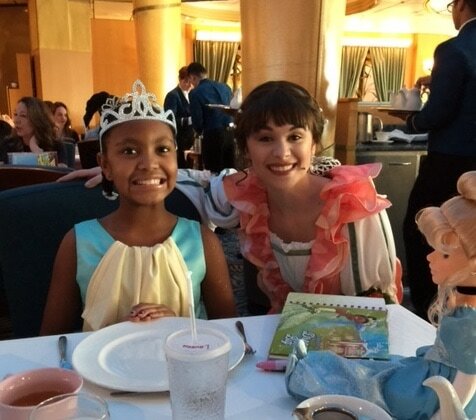 The Disney Wonder has three main dining rooms, Animator’s Palate, Tiana’s Place and Triton’s. Each guest is assigned a table number and a rotation on their key to the world (KTTW) card for which restaurant they will dine in each night. Our dinner rotation was for Animator’s Palate (AP) one the first and last night, Tiana’s Place (TP) on the second and third night and Triton’s (TR) on the fourth night. You are assigned a head waiter and an assistant waiter and they follow you each night to the various dining rooms. My daughter and I were the only two at our table. I was surprisingly disappointed that we wouldn’t get to meet other cruisers and have fun dinner conversation but in the end, we made the best of it and had a great time chatting with each other. Each restaurant had its own theme and menu and after months of scavenging Facebook Disney pages I was pretty convinced that I knew what I should order in each dining room. However, just to be on the safe side, if I was curious about any particular item, I’d ask my server and he’d help me choose between a couple of different tasty options. If you cannot decide, you are able to order as many entrees, appetizers or desserts as you choose. However, I try really hard not to waste food so most times I’d choose one thing. In Triton’s I was advised to try the black truffle purseittes. However, the salmon tartare looked decadently delicious as well. I was incredibly hungry and pretty sure I could finish them without waste, so I ordered them both! They were so divine! I was highly disappointed that I could not have them again after this meal. Many previous Disney cruisers report being able to request meals from previous days or restaurants but when I asked about the salmon tartare I was advised I could not get it again. I did not quite catch what our server said as the reason but in the end the ‘no’ wouldn’t have been any better with a reason than without so I simply ordered something else. I was also advised that if there was any night that you didn’t see any dessert that interested you, order the mickey bars. That was the best advice ever! They were absolutely scrumptious and I only wish that I could find them in my local grocery store. Although everything I tried was very tasty, the other food items that stood out to me as being more memorable were the beignets and the bread pudding at Tiana’s. Both of those are definitely worth trying. 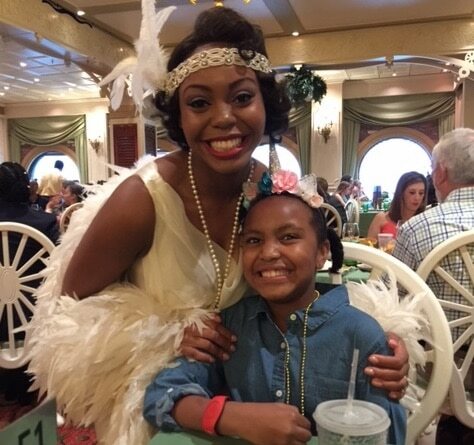 There was friendly banter and competition about which beignets were better between Café Du Monde in New Orleans or Tiana’s Place aboard the Disney Wonder. Since I just cruised out of New Orleans in November, I was able to eat these yummy morsels for a more up to date comparison prior to our January sailing on the Wonder. Both of them were delicious and one absolutely cannot go wrong with eating either of them. However, if I had to choose I’d likely cast my vote for Café Du Monde simply because they had more powdered sugar and they were less dense in consistency that Tiana’s Place. Palo’s is an adult only specialty dining restaurant. Many of the forums posted about how delicious the food was and how it should not to be missed. Additionally, there were fun debates about whether brunch or dinner was better at Palo’s. Though the vote was pretty consistently an even split, the people who opted for brunch often stated as their reasoning how brunch at Palo’s would keep you from missing your rotational dining meals. That sounded like a plan to me so I chose brunch during my online check in. The food was amazing and there was an open buffet as well as a menu from which you could order. The food, the stellar service and the ambiance were definitely worth the surcharge in my opinion. 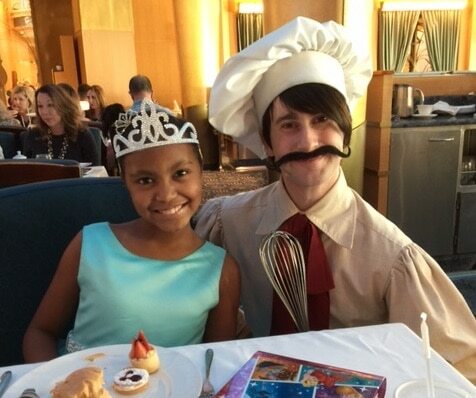 I look forward to dining at Palo’s again on my next trip aboard the Disney Wonder. The remainder of our time aboard was filled with many fun activities. My daughter quickly showed me that she had more of her daddy’s homebody tendencies than my exploration type tendencies by suggesting, quite often, that we go back to the room to watch old Disney movies and order room service. If I would have let her, we would have spent the entire cruise sitting in our well-appointed state room. Clearly, that was not going to happen so we quickly learned the art of compromise. 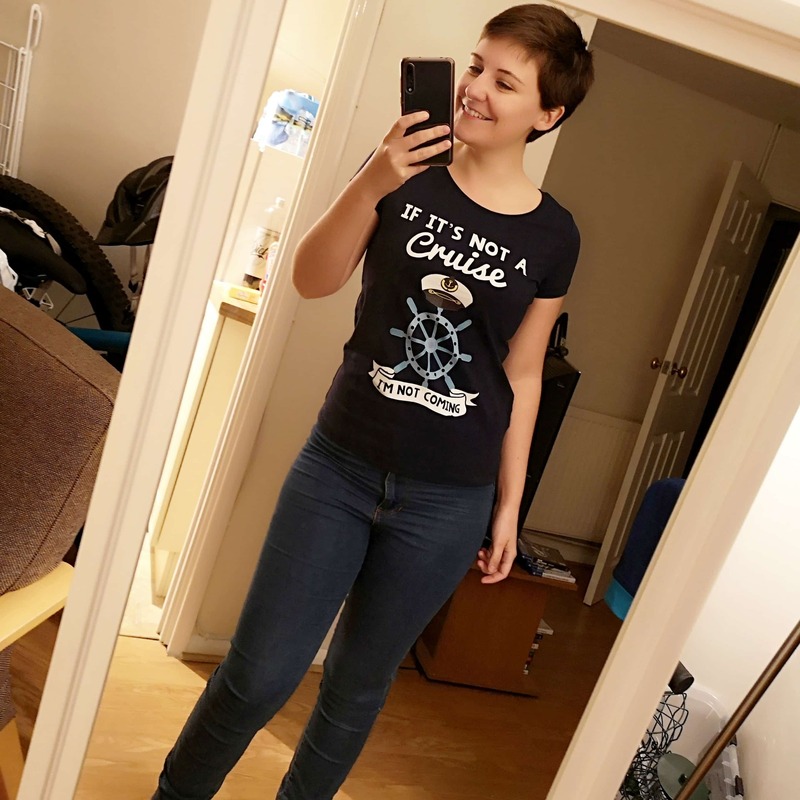 My suggestion was often for my Junior cruiser to spend time in Oceaneer’s, but I mentioned her thoughts and feelings about that. This sailing had three sea days and I quickly realized that I have way too much energy for that many sea days. I was somewhat antsy and initially longed for dry land. That was until I saw the Navigator, Disney’s daily publication. There is literally something to do at all times from morning until late at night aboard the Wonder. Many people comment about bringing highlighters to mark which activities you want to do because there is so much to chose from while on board. However, since there is no way you can do everything, the best advice I received was to save some activities for your next cruise. I definitely agree with this sentiment. I entertained myself with a napkin folding class, a movie in the Walt Disney theater, endless character meet n greets, a relaxing brunch at Palo’s, amazing Broadway shows, reading in the adult only portion of the ship while sipping a yummy coffee from Cove Café, a mixology class and a beautiful afternoon with my daughter for Royal Court Royal Tea. 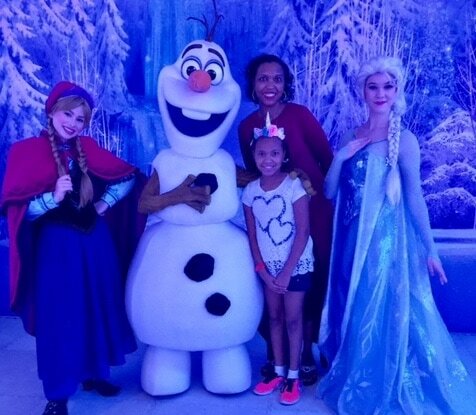 All of the shows that we saw were simply amazing, but Frozen was in a class of its own. The doors open 30 minutes early for the show and it would be in your best interest to arrive at least 40 minutes prior to show time as the line extends down the hall. The show is completely worth every minute of the wait. Disney cruise line does its own rendition of Frozen and adapts it to the stage and they did a phenomenal job. I almost wish we would have skipped dinner so that we could see both the early and late shows. It was really that good! Pirate’s night is a much talked about part of Disney. We made our children dress as pirates this year for Halloween so that they would have proper attire for the cruise. Though the pirate’s night menu in the dining room is my least favorite, the night’s activities are said to be phenomenal with its deck party and fireworks. I, personally, was exhausted and allowed my child to talk me into staying in the room and skipping fireworks for old Disney movies on television and an early bedtime. I look forward to fireworks and the pirate night deck party on our next sailing. 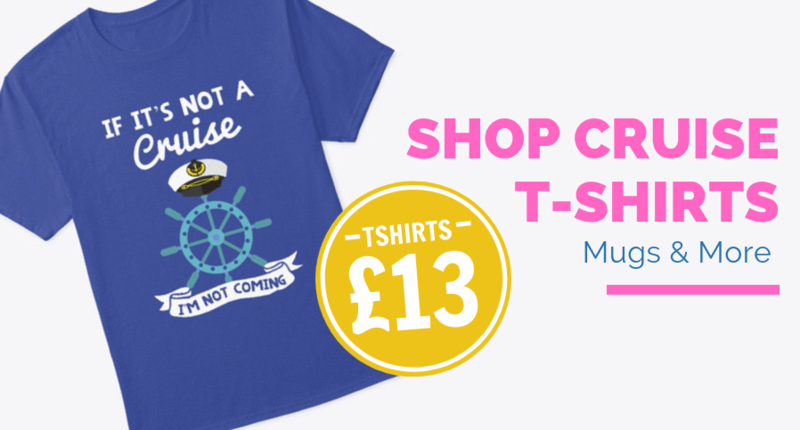 There was only one port of call on this sailing. 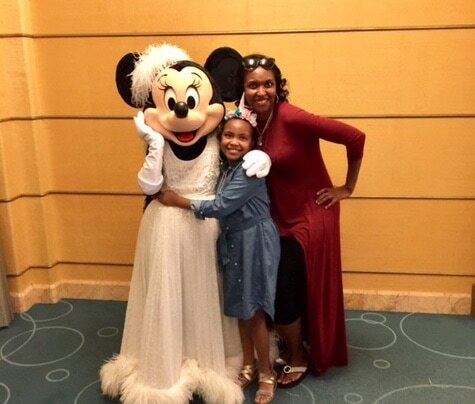 We have never been to Jamaica and were quite excited about the opportunity to sail Disney and visit Jamaica and Puerto Rico (another place we’d never been). We all met at the Walt Disney theater at 8:15 and were assigned a Disney character based upon which excursion you chose. 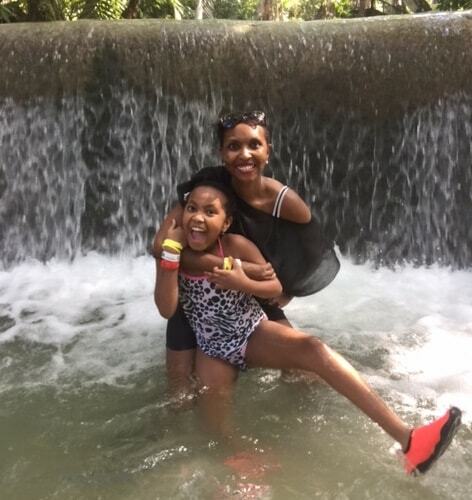 We elected to do the Jamaican bobsled on Mystic Mountain and Dunn’s River Falls (DRF) excursion. Our group was assigned to the Simba group and off we went to load our bus. We rode into town about 30 minutes to take a lift to the top of mystic mountain where we boarded the bobsleds. My daughter rode in a sled without me and I was a nervous wreck. She can be quite dramatic and I was so afraid she’d change her mind or decide altogether that she did not want to do the activity. If you read my last review about the time she went ziplining, then you’ll know she surprised me with her bravery and willingness to try. Well, once again, my little miss amazed me with her enthusiasm and off she went for a fun-filled adventure of flying through the trees on her own bobsled! I was one proud mama! We had a delightful time and were sad when the ride was over. Following our ride, we were served a delicious meal of jerk chicken, fish, coleslaw, rice, beans and lemonade. The children were offered French fries and hot dogs. After eating our meal, watching the dancers and touring the beautiful grounds, we were taken back down the mountain on the lift. What a beautifully relaxing, scenic view. At the bottom of the mountain we were picked up and taken to Dunn’s River Falls. I was incredibly nervous. I read numerous articles and accounts of the dangers of the slippery rocks and rushing water while climbing the falls. However, I was advised by many of our friends that it is absolutely the thing to do while in Jamaica. So, off we went. I put my phone inside a waterproof pouch around my neck because you will get wet. At some points of the climb, I was standing in water that came up to mid-chest and I am 5’10”. You start off on the beach and begin the hour and a half, 180-foot climb while holding hands in a human chain. We dried off and loaded the bus to return to our ship. I made the mistake of trying to stop and purchase some local souvenirs in the shops by the ship and was haggled endlessly. I would definitely caution against this unless you desperately want something, have cash and do not get annoyed very easily by people who do not accept the word ‘no’ for an answer. Once back on board, we showered and changed and prepared for dinner. For the first time in what seemed like forever, I was actually quite hungry. I did not hesitate this time when my daughter suggested room service. I ordered the cheese plate and a Mickey bar (my favorite) and my daughter had wings (her favorite). By the time we arrived at dinner (Triton’s) we were pretty full and not too interested in dinner. I had a salad that I picked at and was ready to go back to the room and relax before heading to the theater to see Frozen. See how the little girl and her habits rubbed off on me. Ha! Much like the embarkation, the disembarkation was smooth and seamless. We were advised at dinner the previous night that we would be served breakfast in our respective dining rooms at assigned times. As we had a tour planned in San Juan, we chose to do the express disembarkation. Once the gangway was open we walked down the hall, went down one floor and off the ship. It was the easiest disembarkation I have ever done and I was more than pleasantly surprised. All in all, we had a phenomenal trip and look forward to more sailings with Disney cruise line. Though they are more expensive than other mainstream cruises, they are worth every penny. 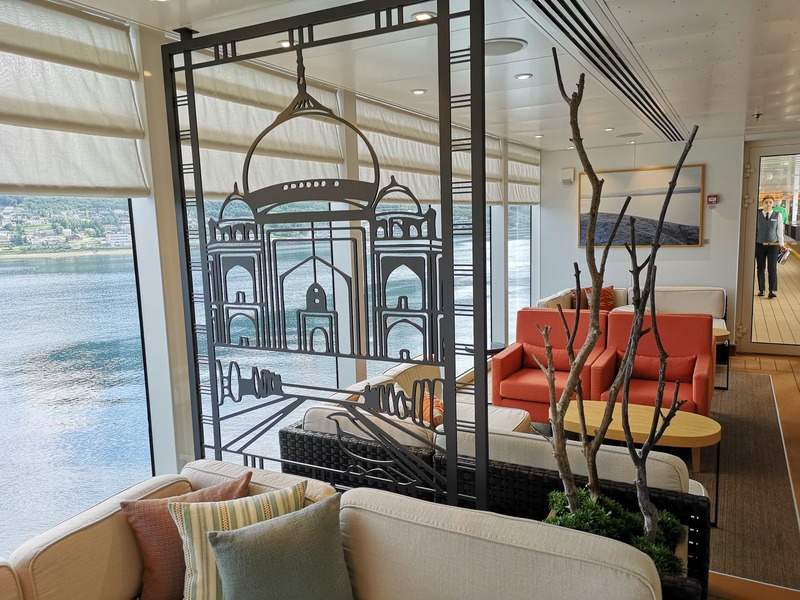 The characters are unobtrusive for those guests who are not as eager as others to view them and the overall elegance of the ship makes it appealing for adults traveling without kids. Though I have not sailed all of the mainstream cruise lines, I am pretty sure that I have found my favorite. Disney was quite impressive and I cannot wait for our next cruise. Wow! Thanks Adrienne. I love your reviews, I almost feel as though I was there with you. I’ve learnt a lot about Disney from this one actually. I had no idea that fish extenders were a thing! I didn’t even know that there were fish on the doors so that was rather confusing when I first saw the ‘Fish extender’ phrase.Rotational dining is such a good idea! I usually don’t like set dining because I like to explore all of this ship. Rotational dining makes that possible! 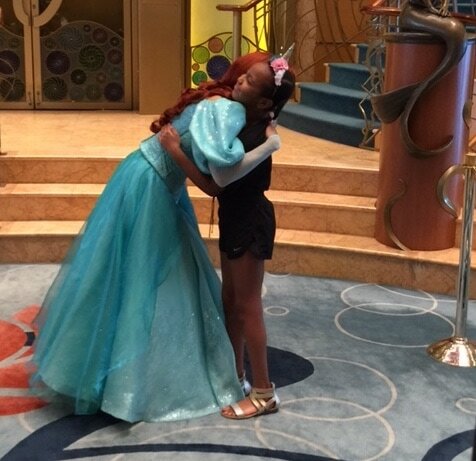 I think my niece (6) would LOVE a Disney cruise. One day hopefully! 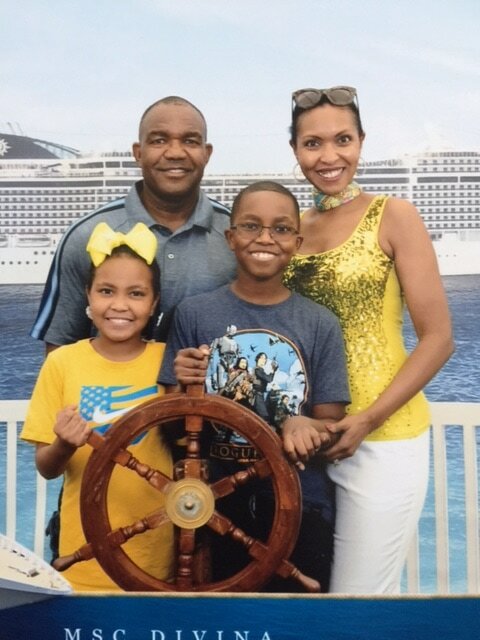 ~Adrienne and her family have cruised on the Carnival Jubilee (2001), Celebration (2003) and Freedom (2016), Royal Caribbean Serenade of the Seas (2006) and Enchantment of the Seas (2017), Peter Deilmann River Cruise (2008), Holland America Nieuw Amsterdam (2013), MSC Divina (2017), Norwegian Pearl (2017) and Disney Wonder (2018). Adrienne has also reviewed the Norwegian Pearl for us and the MSC Divina so make sure that you check those out!